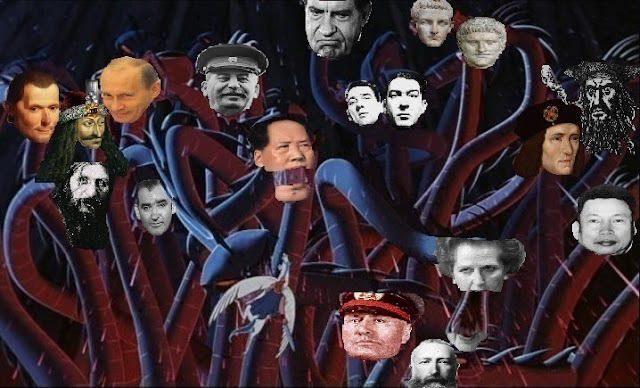 The WORLD'S MOST EVIL HYDRA possesses the heads of history's greatest villains. It is born from the paradox created when somebody tries to go back in time and kill Hitler. STALIN. Bite causes victims to slowly fade from reality. Their past actions are undone, beginning with the most recent, until they are entirely edited out of history. If they've chopped off any heads, those heads will regrow. POL POT. Anyone looking at this head through glasses, or any other kind of manufactured lens, must save or die instantly. NERO. Breathes fire. The flames crackle with the sound of fiddle music. BIN LADEN. Tall buildings in the vicinity spontaneously collapse. VLAD DRACULA. Causes wooden stakes to spring out of the ground beneath people. THATCHER. Iron teeth. Bite curses victims with slow starvation. CASTRO. Breathes cloud of foul-smelling, vision-blocking, lung-invading cigar smoke. JUDAS. Barfs a torrent of silver onto the ground. Anyone who takes the silver will be compelled to betray their friends. BLACKBEARD. Beard braided into writhing pigtails, stuck through with lighted matches, that entangle foes and burn them. NIXON. Pins victims down with its jowls and drowns them in flopsweat. CALIGULA. All horses in the vicinity become senators and refuse to obey the authority of their riders. TRUMP. Endless stream of blather forces victims to save against confusion and despair. MAO. Gaze forces victims to kneel in place and confess how they have betrayed the revolution. Failure to confess anything will result in laceration with broken glass. RICHARD III. Seems surprisingly reasonable. Whispers to party one at a time, sowing demoralisation and discord. TOJO. Birds and other flying things divebomb its victims and explode into balls of fire. CROMWELL. Any monarch within a mile who takes any damage will immediately die. MCCARTHY. Victims must save or be convinced that the hydra is an illusion created by secret witches. MACHIAVELLI. Hangs back and advises the other heads, making them more cunning and powerful. PUTIN. Knows the most embarrassing secret of anyone it fights and will threaten to reveal it unless they serve its agenda. RASPUTIN. Hypnotic stare. Can't be chopped off until it has been drowned, shot and poisoned. ATTILA THE HUN. Head can't be cut off, but will die if given a nosebleed. THE KRAYS. These two heads will regrow unless they are chopped off simultaneously. NED KELLY. Head can't be cut off unless iron helmet is first removed. Attacks with headbutts. Hates coppers. LEOPOLD II. On a critical hit, bites off a hand. ROBESPIERRE. On a critical hit, bites off a head. JACK THE RIPPER. On a critical hit, tears out a random organ with its teeth. MUSSOLINI. Hydra is accompanied by 1d20 low-level thugs in black clothing, who will flee if this head is defeated. GENGHIS KHAN. Hydra is accompanied by 2d4 horse archers, who will flee if this head is defeated. AL CAPONE. Hydra is accompanied by 1d4 high-level enforcers from local thieves' guild, who will flee if this head is defeated. Bleeds moonshine. TORQUEMADA. Always gets a surprise attack, as nobody expects it. This is nuts and awesome! I feel like we never come back to than the hydra more than anything else. They are so damn good at what they be. A lot of Australians consider Ned Kelly a hero or at least a victim of circumstance. Even looking at his actions in the worst light he killed only a handful of people. Maybe you could put Pauline Hanson up there instead? Isn't making people believe something real is an illusion the opposite of what McCarthy did?